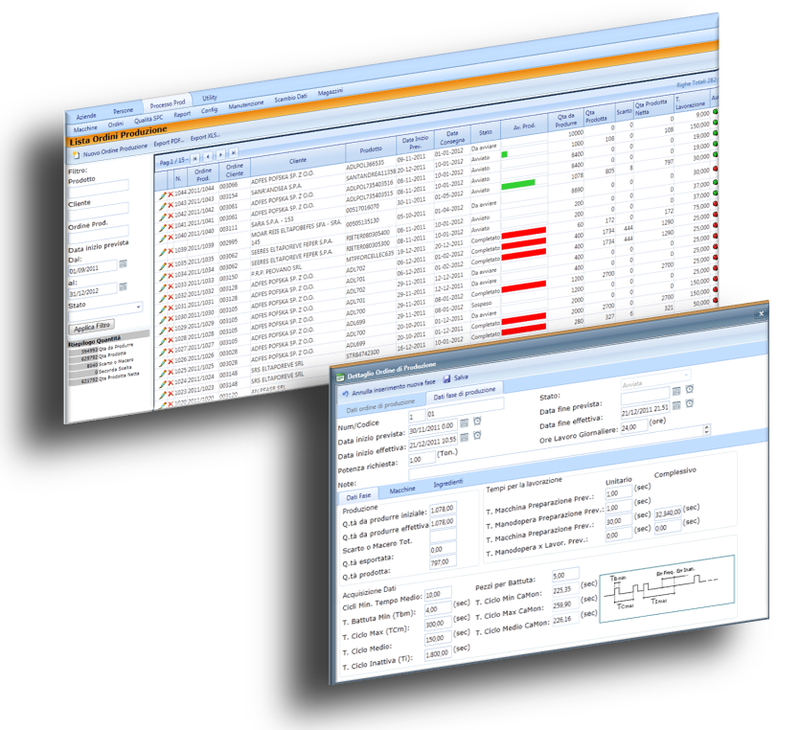 Production management and monitoring GestProd is the perfect solution for the production process management designed for any kind of company. The software, developed with Microsoft technology, has been successfully implemented by plastic production, construction and packaging companies. GestProd is an essential working tool for companies who are eager to successfully compete within a more and more demanding and sophisticated market. GestProd enables the management of productive processes through the use of sophisticated computer algorithms in order to set up operations evaluating simultaneously a large number of key elements such as the commissions priority, deadlines, available resources and the productive capacity. The capture of data coming from the production units allows a complete supervision of the production progress, the working load and the efficiency of divisions. 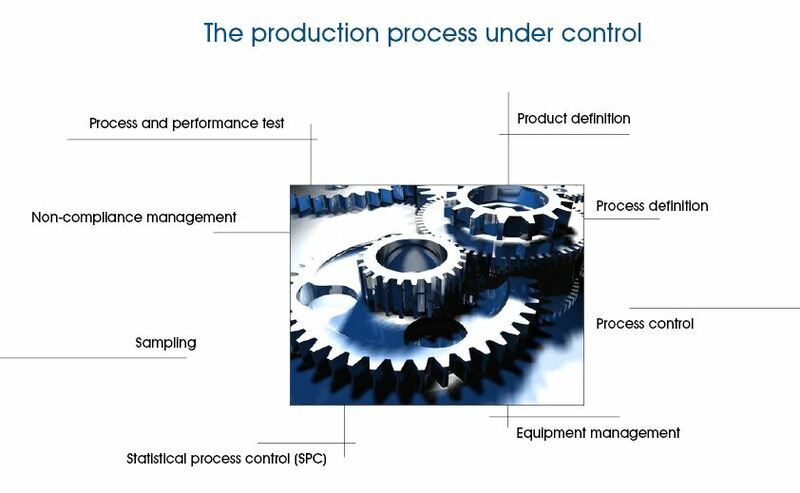 Through the integration with measuring tools, GestProd enables to plan and record the quality controls providing an essential instrument for a totally computerized management of the stistical governance of the production process. 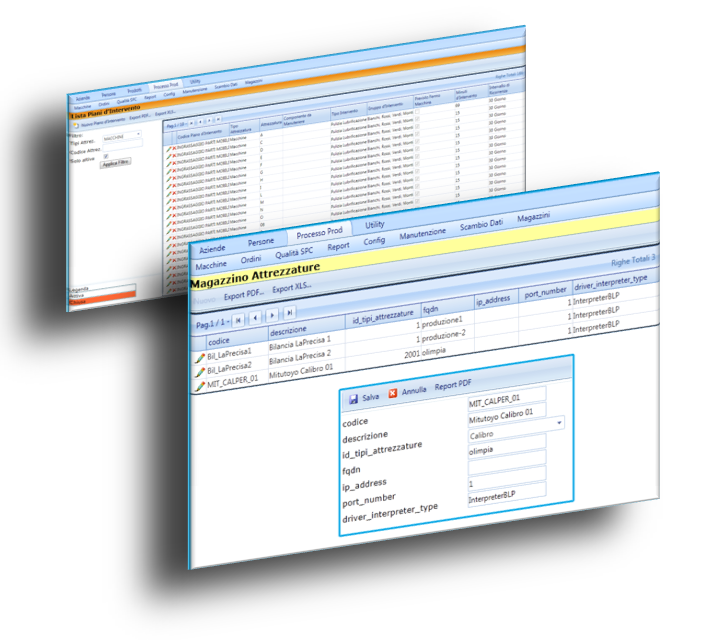 GestProd manages a complete product database in order to classify a product for features, categories, costs and bill of materials. Moreover, GestProd allows to set the work phases, along with the definition of production orders with unlimited levels, contributing to convert raw materials into final products. GestProd is able to track any operation required to make a product through the management of production orders in accordance with the customer's demand and deadline. The management of production models, through scheduled production orders, enables a balanced distribution of the workload on each plant or production line. Furthermore, GestProd allows the control of production progress by detecting electrical signals coming from machineries. The management of production orders demands the operator to test carefully the whole production process. GestProd goes along the operator in order to promptly carry out the correct quality tests. A real-time monitoring of the production progress of the whole installation is available through a user-friendly synoptic map of machineries. 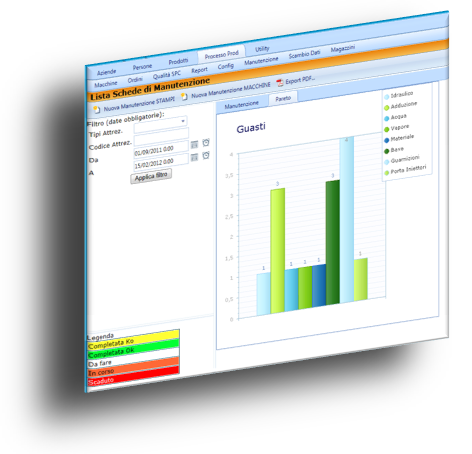 The software functionalities provide the control of the installed manchineries and the measuring tools in use. Scheduled operations allow the definition, for each machinery, of maintenance plans in order to set the necessary operations monthly as well as yearly. 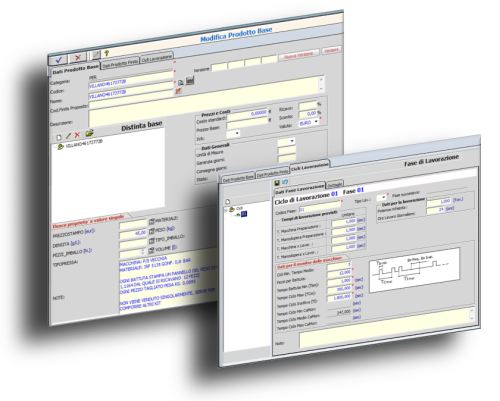 Furthermore, GestProd enables the association between a machinery and a chosen operator as well as the machine downtime. 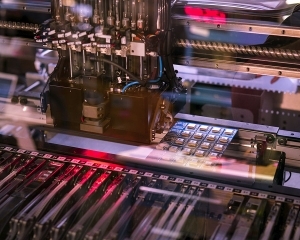 Data connected to the maintenance, integrated with unexpected machine downtime data, combine to improve the general efficiency of the whole plant. GestProd provides several quality management instruments, allowing the operator to promptly detect the shortcomings within the production processes, to schedule fixing operations in real-time and to constantly improve the production processes through the decrease in unexpected events. 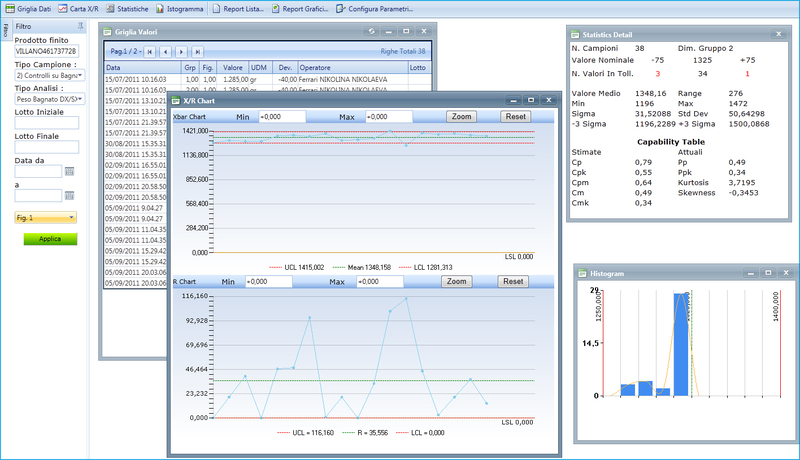 GestProd enables the configuration of each product according to the connected measuring operations. Such action is carried out by two kinds of alert: through the consultation of the synoptic maps of the plant and through a light indicator such as the tower lamps "telemecanique". This warning type helps the operator to choose when to take a sample or to record a dimensional analysis. Information coming from one or more measuring centers is recorded in order to provide a fast and effective supervision of the whole production process through a synoptic map. The software provides the most used SPC features such as: sigma (real or extimated), cp, cpk, pp, ppk, cm, cpm, skewness, kurtosis, X/R maps and gaussian histogram. 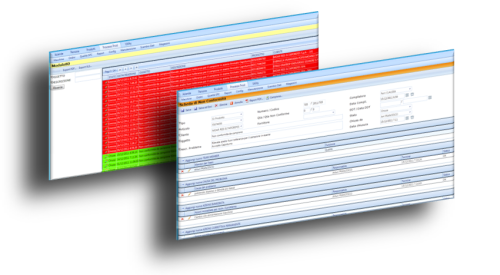 GestProd controls the non-compliant products management during the whole production process. The operator can record non-compliant pieces by selecting the quantity and type of detected errors. GestProd provides the recording of production waste along with a technical file of non-compliance in accordance with the 8D Module following the automotive industry guidelines. Companies who work in a more and more competitive and extended market must afford a defect-free product in order to provide the customer with the highest quality standards. GestProd allows a complete management of the whole production process through the use of a large number of analysis and reporting models. By reporting the measurements on the samples taken, non-compliant products and waste production, GestProd can generate indicators of production efficiency and non-compliance (Pareto diagrams). 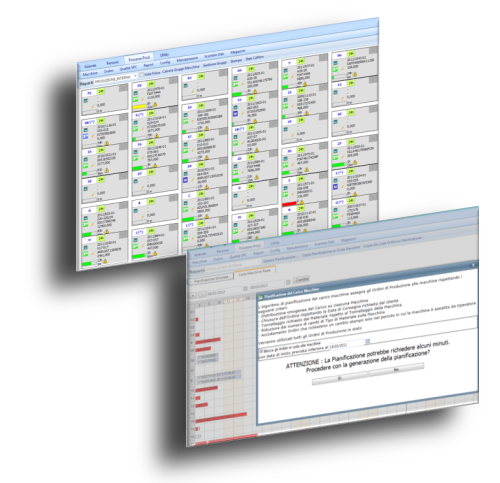 The EBoard function module enables a comprehensive tracking of the production process of electronic boards, reporting and identifying each production phase, production batch, component and feature of a semifinished or final product. Furthermore, by the elaboration of the recorded data, EBoard allows to reconstruct the production process of each product, assuring the compliance to the selected requirements and provides the operator with a tool for the management of non compliant products in order to guarantee the highest quality standards to the market.